Push notifications have been transformed to become one of the best friends of digital marketers out there in the world. In fact, every single business out there in the world should take a look at the browser push notifications and take appropriate steps in order to add that to the marketing mix. Below mentioned are 8 prominent reasons why you need to invest in Browser Push Notification. If you are convinced by these 8 reasons, you can go ahead and get them to your marketing mix to enjoy the benefits. In order to send out browser push notifications, you will not have to think about collecting personal details of your potential customers. In fact, people in today’s world tend to think twice before they provide their personal information to an unknown entity. Due to this reason, the collection of personal information would be a tough battle for you as well. Why do you need to go through such a hassle when you can simply use push notifications for the digital marketing campaigns? You just need to get one-time approval from the potential customers and you will be able to keep on sending notifications to them. This is one of the straightforward benefits that you will be able to receive along with push notifications. You are provided with the complete freedom to redirect your customers to any page with the assistance of push notifications. This cannot be experienced from the traditional email marketing campaigns. When you send out emails with affiliate links, they will often be marked as spam mails. But that will not happen when you use push notifications. The notification will be sent regardless of the content behind it. Hence, you are provided with complete freedom over sharing any desired link over push notifications. However, you should be careful with it because incorrect decisions can tarnish your business reputation. In order to survive in today’s competitive marketplace, it has become important for the digital marketers to introduce branding into their marketing campaigns as much as possible. That’s where the push notifications come into play. With push notifications, you can easily send out branded messages to your audiences. This can contribute towards the visibility of your brand in the long run. For example, you can easily integrate the logo of your brand into the push notification that is being sent out. This will assist you to get noticed among potential customers as well. From the recently conducted experiments, it has been identified that the click through rate associated with push notifications is extremely high. The push notifications are usually being sent directly into the internet browser of visitors. Hence, a person who receives a push notification will be tempted to go ahead and open it. This is the main reason behind the high number of click through rates behind push notifications. You will never be able to receive such results with the use of email marketing campaigns. That’s because a considerable percentage of emails that you send out as a part of an email marketing campaign will end up in the junk mailbox of your potential customers. You will never be able to get any clicks from those mails. You don’t need to spend any money at all in order to experience push notifications. The service is being offered to you completely for free. You cannot find any other effective marketing methods like push notifications. Even to send out emails, you will have to spend a considerable amount of money and purchase tools. On the other hand, people who engage with social media marketing will also have to spend money to enhance the visibility of campaigns. But you don’t need to spend money like that to send out push notifications to your audiences. The opt-out rates linked with push notifications are considerably low. If you take a look at the opt-out rates associated with SMS marketing campaigns and email marketing campaigns, you will be able to get a clear understanding of the above mentioned fact. 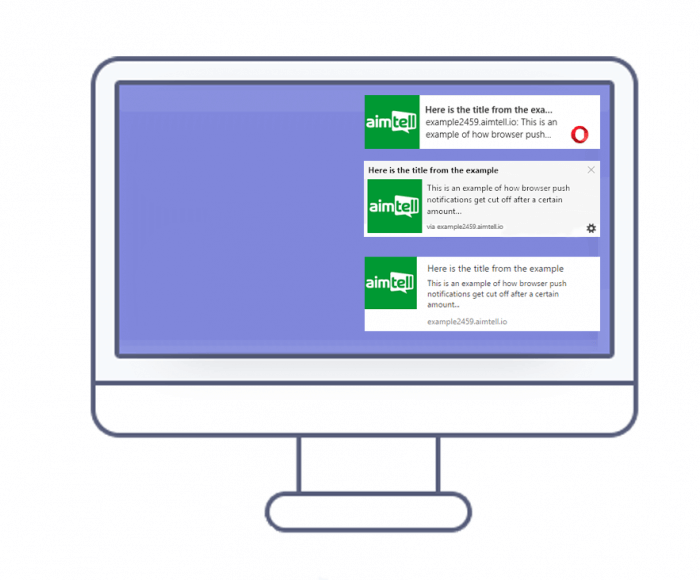 A user will be able to opt-out push notifications after receiving the message. But this will not happen in most of the scenarios. That’s the main reason why push notifications provide you with the ability to enjoy reduced opt-out rates. With the help of push notifications, you will be provided with the ability to enjoy an increased amount of opt-in rates. This is something that you can be proud of while using push notifications. In order to opt-in a push notification, a user should click on a button at a time. On the other hand, the button would be a pop up on the webpage. Hence, the user will never miss out the notification. Now you have read a large number of benefits associated with push notifications. Due to this reason, you can think about adding it to your marketing mix without having a doubt on the mind. It can also be considered as the future of digital marketing. If you can get your hands on push notifications as soon as possible, you will definitely be able to experience all the good things that come along with it. This will take your digital marketing campaigns to the next level. In addition, you will be able to attract a lot of new customers to your business and increase the sales volume that you make at the end of the day as well.